Saturday morning rolled around rather quickly and that meant one thing. Scoobapalooza. Whats Scoobapalooza you ask? Picture every Subaru that you see on a daily basis in one central location. I've always been a raging fan of Subarus especially the Forester Wagon. I arrived a little after 10 or so and found the fellas from Diode Dynamics where I'd be hanging out most of the day. The lot filled up quickly and there were Subarus as far as the eye could see. 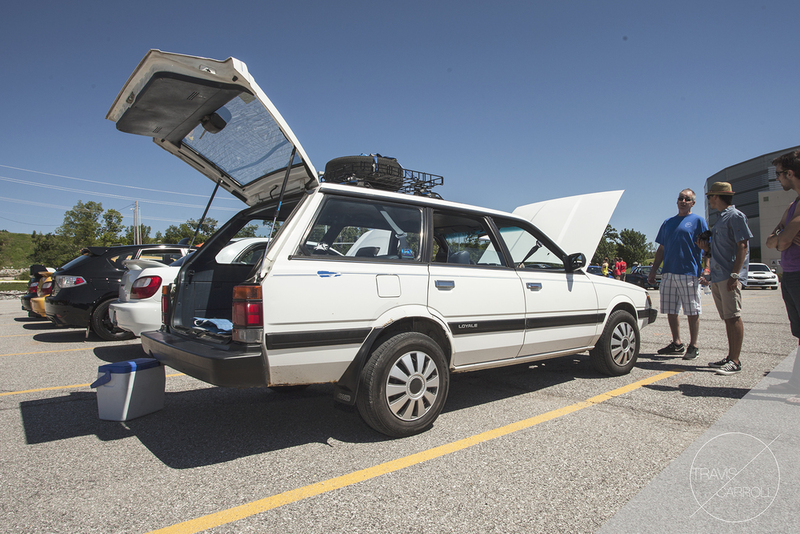 There were an abundance of STI's (of course) and such but what really caught my eye and was hands down my favorite Subaru at the show was a 1992 Loyale Wagon. this thing was incredible. The guy who owned it was pretty rad as well. Originally he had bought it for his son and ended up giving his son the Volvo and kept this beauty for himself. It was definitely refreshing to see such a unique car in a sea of STI clones. There was also Autocross at this event which was pretty cool as well. I'd never really sat and watch autocross before but I can honestly say I almost fell asleep watching the same 10 or so cars rip through some cones. The best part of the autocross was hearing the sounds of those beasts, oh and the couple of people who spun out a few times, haha. All in all Scoobapalooza wasn't half bad! It was pretty hot out and of course I thought it was a great idea to wear all black (shocker) but aside from the heat it was awesome to be out and hangout with my friends for a little bit, and have some good conversations with some car owners. Definitely enjoying these busy weekends and am looking very forward to more!